Arise ‘n’ Shine’s “Camp Infinity” is a combined summer camp package that offers infinite opportunities for skill development as well as fun intensified activities. This camp enables your children to sharpen fundamental skills, nurture their emotional quotient before they take the next step in their academic front, as well as enjoy the summer time through fun intensified learning activities. We have activities grouped for the ages 2-3 years / 3-5 years / 5-8 years / 8-12 years. Each age group largely focuses on activities and skills that are critical for their wholesome development. We encourage your children to gather their friends and get reloaded! Self Help- Manners and Beyond helps them be more independent and organized. Act Express- from Page to Stage makes them more confident, helps them to get rid of stage fear and kindles creativity. Art Effect- Reflect yourself is a key to self enhancement and motivation. 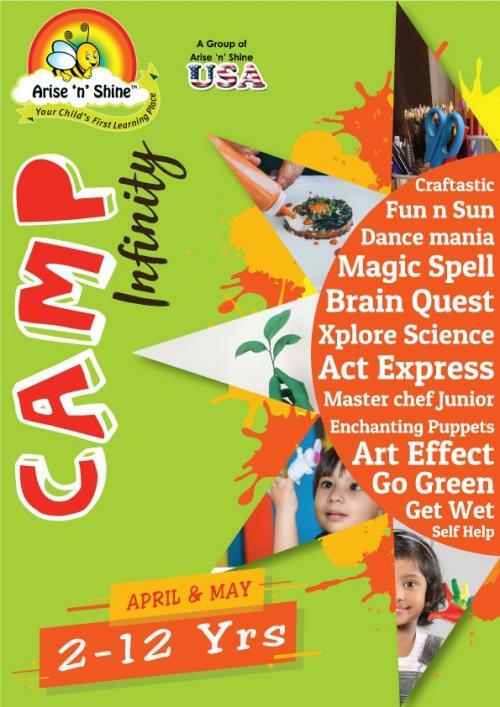 Other fun activities like – Master Chef Junior, Dance Mania, Craftastic, Get Wet, Lemonade Stand, Xplore Science, Magic Spells, Fun ‘n’ Sun, Enchanting Puppets, Go Green, Life Skills, Field Trip and Grand Finale.